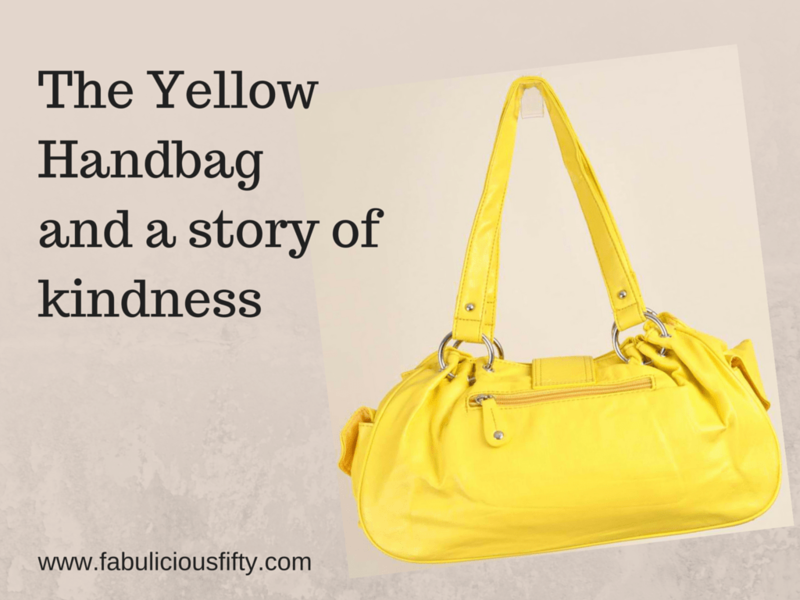 This is a little story about a yellow handbag, but really it is a story about human kindness. I was visiting London just after Christmas and was delighted to receive a beautiful yellow handbag as a gift from my sister. I was excited, and immediately changed everything over. The next day I packed up my things to catch a train to Birmingham where I was attending a craft exhibition at the NEC. I felt really smart heading off with my new handbag and a borrowed backpack. I need to stop here and draw a little picture of where I was in my life at the time. I was suffering from severe depression and had made a decision (on my own) to come off the anti-depressants. While I was over in London my Dad was diagnosed with prostrate cancer, and I was trying to process this. Life was a little hard, to be honest but I was still determined that all would be well. On the second day of the exhibition I packed up early and had a quick breakfast in my hotel in the centre of Birmingham before catching the rush hour train from Birmingham Central to Birmingham International. I boarded the train with my backpack, my yellow handbag and my bag of goodies from the exhibition. What I didn’t realise was that my body was going into withdrawal from the anti-depressants and that quite honestly I was cracking up. It is a short distance from the station to the exhibiton. Considering the day ahead, I walked along and then I stopped and stumbled and nearly fell over in shock. I didn’t have my handbag with me. Passport, money, phone, train ticket, air ticket, house and car keys, everything. I felt physically sick. I stumbled along to the organiser’s office where I told them what had happened. They offered me a seat and the use of the phone. By this stage everything had closed in on me. I was crying uncontrollably. The shock added to everything else that was going on in my life, the worry about my Dad and the loss of my handbag had flattened me. I had no idea how I could even get back to London, never mind Ireland. I walked back to the station and asked about my ticket. “You need to purchase another ticket to London”, I was told. I walked back to the NEC – I didn’t know what to do. On returning to the exhibition I tried to focus and realised that I needed money of some sort to at least get back to London and to my sister. Thankfully Sara from Crafters Companion, who was exhibiting, knew me didn’t even hesitate – she loaned me 50 Pounds. I tried to enjoy the exhibition but by this stage my heart was not in it. I felt broken. Walking back to the station, yet again I really didn’t know what to do. Something led me back to the enquiries office where I had been turned away earlier. The man on duty clearly saw my distress and told me to go down to Platform 7. There I met the kindest man who took my missing handbag seriously. He called everyone he knew. He traced the train down to London where it was on a siding being cleaned. He spoke to the cleaners. He left no stone un-turned. He checked every station along the way. He checked lost property. I just sat there with my crumpled tissue feeling lost and desperate. Eventually he had exhausted all his options and we called the police. There had been a number of incidents where handbags had been stolen they told me. They took down the report. Just as I sat down the phone rang. ‘Stay here,” he said. Minutes later he walked in with my handbag. My beautiful handbag. ‘Check it please,” he said. I did and nothing at all was missing. The story was that one of the staff members on Virgin Trains had seen me get on the train at Birmingham Central with the yellow handbag and seen me get off at Birmingham International without it. She was near the area where I was sitting, and rescued my handbag and brought it back to Birmingham International where she knew I would be stranded. This was quite a few years ago, but I have never forgotten the kindness of the man who helped me search for the bag and the woman who had cared enough to bring it back to me. I don’t know if it is possible, but perhaps through social media I might find this angel and be able to thank her properly. If you have a kindness story, I would love to hear it.